Chevy has announced a new and very limited edition of the 2018 Corvette. 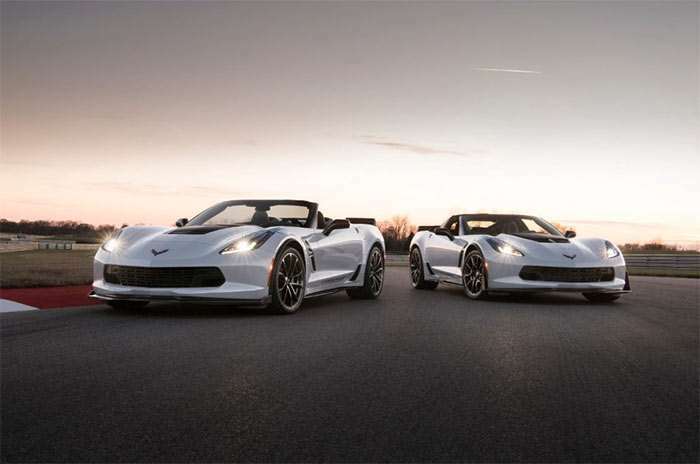 The car is called the Corvette Carbon 65 Edition and is meant to be a 65th anniversary celebratory model. It will be offered based on the 2018 Grand Sport 3LT and Z06 3LZ models. Only 650 cars will be produced globally and each will be numbered. The car gets carbon fiber exterior bits with a new carbon rear spoiler and quarter ducts, ceramic matrix gray exterior color, and special interior tidbits including a carbon-fiber rimmed steering wheel. Convertibles get carbon fiber tonneau inserts while coupes get a carbon fiber roof section. Convertible versions of the car are available and will all get a blue convertible top. Black wheels and summer only tires are part of the package. Brake calipers are painted blue and the wheel center caps get the Carbon logo. Pricing and exact availability of the Carbon 65 Edition are unannounced.